If you were told you had to build a LEGO kit, what would be the first thing you should do? What’s the process? Open the box and find the directions, right? However, if you are brazen enough to try building a kit without following the instructions, the end results typically won’t look like the picture on the box and certainly won’t work as you had planned. LEGO provides specific sequential instructions because the success of the users depends entirely on how closely they follow the specified process. Successful outcomes for accessible residential remodeling are no different. Over the past 15 years Accessible Housing Services has developed a proprietary process to execute our designs and achieve outstanding results. We have experienced projects where our specified installation process has been altered by a contractor or installer. The consequence is usually additional time added to the projected completion date, further impacting the home owner. The successful outcome of a new exterior ramp that will meet a new walkway or parking area is largely measured on two factors. 1) Ramp slope consistency, 2) Smooth transition from ramp to new surface. AHS specified that the contractor shall build the ramp prior to the installation of the walkway/parking surface to ensure both of those goals are accomplished. 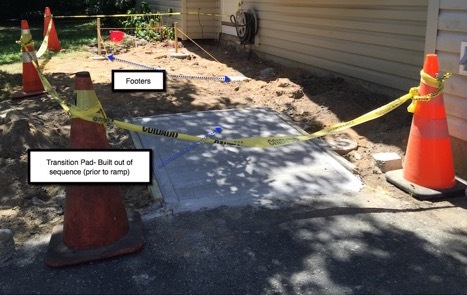 Footer height variation, small variations in board thickness (fractions of an inch), even slightly warped stringers over the distance of the ramp can change the final elevation of the last deck board by ¼” – ½” or more, a significant obstacle for a wheelchair. If this occurs, and the contractor has followed our protocol, he/she can adjust the walkway height to ensure a consistent slope is maintained and it is finished with a flush transition to the final surface. This contractor altered our steps by only having one concrete pour to form the footers and transition at the same time. While this approach can save money, it doesn’t take into account the possible variations we listed above. The result was a slab that was too short for the ramp. A second concrete pour had to be completed causing additional expense and time. Combining AHS’s evaluation, design and proprietary process with proper execution ensures achievement of outstanding residential accessibility and functionality the first time. This article was written by Scott Jones of Accessible Housing Services. See Bio here. Scott Jones is a licensed occupational therapist with more than 10 years experience. After earning a master’s degree from Ithaca College, Scott relocated to Baltimore to begin his journey of refining and developing his skills as a home modification specialist. Scott completed his final clinical affiliation in a specialty field for home modifications at the Southeast Senior Housing Initiative, a Johns Hopkins University sponsored program. Scott traveled to the homes of low-income seniors, evaluating and implementing simple adaptations.